Don't let the Minima deceive you - it may be small but the gold plated electrodes give added power for a smooth and powerful pelvic floor workout. The two gold-plated electrodes are also nickel-free making it the safe choice if you have ever suffered nickel intolerance. The neat design of the Minima is comfortable, easy to insert and one of our lightest probes. It connects to your Kegel8 or other electronic pelvic floor exerciser like any of our other probes via your lead wire and is easy to rinse clean. 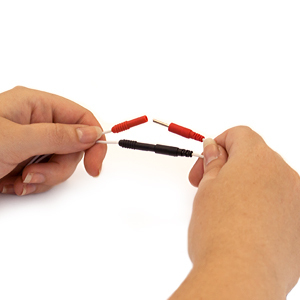 This probe is fitted with 2mm female connectors and are compatible with most TENS/STIM/EMG machines via your leadwire.